It's all in the Shape!!! It's Tanya Leigh here and this week it's my first time posting on the DCM blog along with my dare this week for you all. I would like to thank everyone for joining in on last weeks dare and also the mid week dare. Amazing the amount of people who joined in on the dares. Keep up the great work guys! The Design Team have been busy working on this weeks dare ' It's all in the Shape' set by me. I'm a fan of shaped cards so thought this was a great one to do for my first dare. You can do any theme but your card has to be a shape of some sort. If you don't have any shapes check out the internet as there are heaps out there. So go for it and can't wait to check out what you guys came up with. Thank you all for the wonderful creations that you have produced for Sue's cool 'beady' dare. We've enjoyed looking at them all- and there is still time to get a beady card done if you get a chance. Meanwhile, for those of you who might be twiddling your thumbs here's this weeks mid week dare and we are now onto our 5th in the series of our Anniversary gift theme inspiration. We have our 'Beady' eyes on you! Hi all, it’s Sue here and it’s my turn to set the dare for you this week but before I do I’d just like to thank everyone who took part in our ‘Animalia’ and mid week little extra this week. The team have had their ‘beady’ eyes on you all and have been checking out all the wonderful cards that you’ve made. If you haven't already taken a tour around the cards on the comments lists then can I suggest that you take a few minutes to check them all out because you really don't want to miss seeing them - they are fab. Now, that fact that the team have had their ‘Beady’ eyes on you brings me nicely to my dare this week. I’m sure that most of us girlies had a bead box when we were little and if you were like me, would spend hours sorting and swapping them with friends. Come to think of it, things haven’t changed that much because I still have a box of beads and I’m hoping that you do too. For my dare this week I would like you to make a card that incorporates beads somewhere in the design…..it’s as easy as that! It can be one bead, lots of beads, big beads, and small beads, whatever you like as long as there’s at least one on your card somewhere. Don’t forget to leave us a comment and your Blog link and we’ll come over to check out your creations and even if you don’t have a blog, you can still join in the fun. Just send a picture or scan of your creation to daringcardmakers@hotmail.co.uk and we’ll add it to our gallery for all to see. The team have been thrilled once again this week to see so many of you taking up Mel’s ‘Animalia’ challenge. The cards you’ve all created have been a real source of inspiration so keep up the good work and if you’ve still not made your card for Friday’s dare there’s still time to have a go. The inspiration for our Little Extra this week once again comes from the list of Traditional and Modern wedding gifts. We would like you to make a card using Bronze, pottery, linen or lace. Your card doesn’t necessarily have to be an Anniversary card, it can be anything you like as long as it incorporates at least one of the above elements. Please remember to add a link in the comments when your card is finished so we can all pop along to see you master piece. Here's some cards from the design team to help give you a little bit of inspiration....not that we feel you need any help from us! Thankyou to everyone that participated in our mid week dare. There were some fabulous cards created and it was great to see so many of you having a play with some anniversary paper and clocks too. I've based my dare on the book by Graeme Base called 'Animalia' (just because that book happened to be sitting near my desk when I realised it was my turn for the dare this week). to inspire your card making this week - which is nice and easy don't you think? Remember, your card doesn't have to be an anniversary card, it can be for any occasion, we're just using the themes for inspiration purposes! Thanks once again to everyone who took part in both Lythan's dare and also the mid week anniversary themed dare. Its been great to see all your creations. This week we have a team dare for you ....and we have been looking at Recycling once again. BUT there is a tiny twist! (you'd expect no less eh?) We want you to have a look at old shop bought greetings cards, wrapping paper or gift bags which you have received in the past and recycle any elements to make a card of your own. You could use them to make backgrounds, cut small focus pieces out, or use the flowers, ribbon and other interesting bits and pieces that are often attached to the cards. So there you go! Simple eh? So come on join in and reuse, go green, start recycling! Here are some from the design team to get you started. Hello all ! Thank you all once again for taking part in Lythan's 'Ad- dicted' dare, we've been checking out your creations, and are all as wonderful as ever ! Our mid week dare has come flying around again and we have gone back to our series of cards inspired by Anniversary gift themes for this weeks little extra dare. which has been randomly picked- just to keep you on your toes ! :)Do with it what ever you wish, it doesn't have to be aniversary card, just inspired by the gift theme. Here's a few examples from that the design team have come up with. Have fun ! 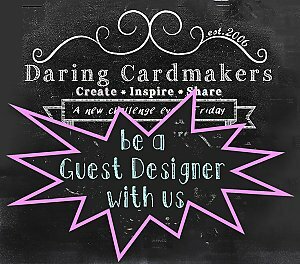 Don't forget to leave us a link to your card- so that we can share your beautiful work ! Hello peeps! Lythan here. We are loving all the card creations that you have been sharing with us this week. It is good to see so many people as addicted to challenges as we are! I want you to browse the tv and magazines for advertisments and use them as inspiration. It might be the format, the colours, the products, the slogan - whatever floats your boat. Remember you can do this anytime, any place, anywhere as long as you link it to this blog in the usual way! Today we say a tearful goodbye to Michelle - our first month long Guest Designer - it has been great to have you play with us Michelle. And hello to our May GD - Vanessa, otherwise known by the delightful name of Ellepiggo!